With Spring’s chilly beginning this year, dry winter skin still seems to be a still present issue. 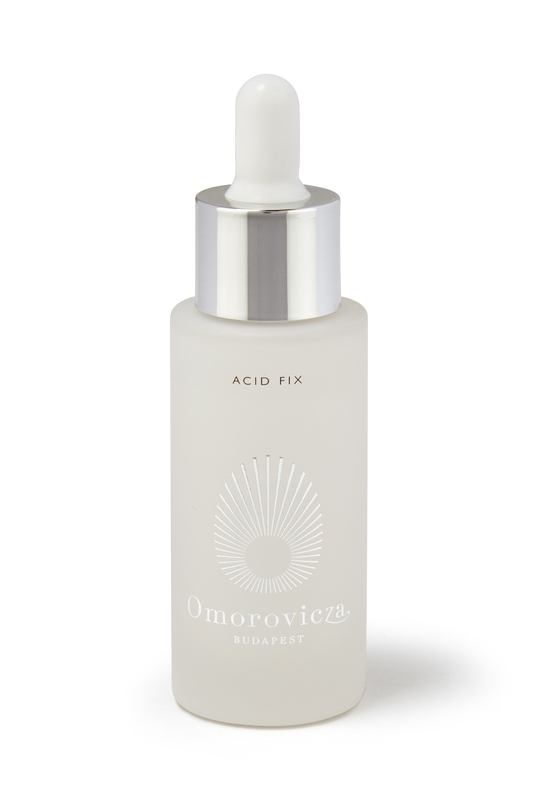 Fear not, Budapest skincare brand Omorovicza has launched their solution for better and brighter skin, Acid Fix. Acid Fix is a multipurpose chemical treatment that exfoliates, peels, resurfaces, and plumps the skin for a natural glow, firming and brightening the skin for a smooth complexion that makes spring skin look easy. Getting to know the ingredients of any products you put on your skin is very important, but understanding what they do as opposed to what they are is crucial, which is why getting to know the difference between, for example, AHAs and BHAs is a step in the right direction. Used for even, luminous complexion, Alpha Hydroxy Acids (AHAs) can be dissolved by water, meaning they make great exfoliators to leave skin clean and vibrant. Beta Hydroxy Acids (BHAs) are oil soluble, therefore they effect both what’s on the skin and within it, leaving skin clean and fresh. There are six key ingredients in the Acid Fix. So what’s what? Australian Caviar Lime is an AHA acid is extracted from the pulp of the Australian Finger Lime plant, the natural exfoliator containing citric acid boosts cellular turnover, meaning that it eradicates skin cells that block the pores. This benefits the skin as it enhances the moisture in the skin as well as stimulates collagen, leaving skin brighter, softer, and glowing. Glycolic Acid is derived from natural sugar and is a strong AHA; the properties of glycolic acid make it a fantastic exfoliator leaving a clearer complexion, preventing the build-up of dead-skin in the pores. Similar to Australian Caviar Lime, it also boosts cell turnover and stimulates collagen, resulting in the same effect. Lactic Acid is an AHA and natural exfoliant that can be found in some foods and can control breakouts and smooth out the skin to leave a brighter appearance and also promotes cell turnover. A large benefit to lactic acid is that it enhances the other products in your skincare routine and reduces scarring and pigmentation marks, evening out the skin tone. Salicylic Acid is one of the BHAs used in Acid fix and also boosts cell turnover but has other properties. Due to it working within the skin as well as on the skin, it both dissolves any dirt and dead skin cells sitting on the surface, as well as limits sebum production so that oil and dirt don’t build up. These properties reduce shine but enhance glow so that your skin stays clean and fresh. Sodium Hyaluronate acid derives from hyaluronic acid and is used to retain moisture in the skin for long-term purposes. It also repairs the skin’s natural barrier that may have been damaged over time. It gives the skin a lustrous glow and plumps fine lines and wrinkles, making your skin appear smoother and more youthful. The final ingredient in Acid Fix is Omorovicza’s Healing Concentrate which firms the skin, creating a youthful, healthy complexion. Acid Fix is designed to be used at night and the best way to include this product in your skincare routine would be to start off gradually, especially if you have sensitive skin due to how active the ingredients are, being made up of 10% acid, making it very strong. Check our article on what to use where if you have sensitive skin here. Overall, Acid Fix really is the perfect fix for dull, dry winter skin that needs a boost that doesn’t disappear every time you wash your face, but improves gradually the more it’s used. Omorovicza hits the nail on the head with this small miracle.